Cedar shakes mix with siding and stone to create a richly textural Craftsman exterior. 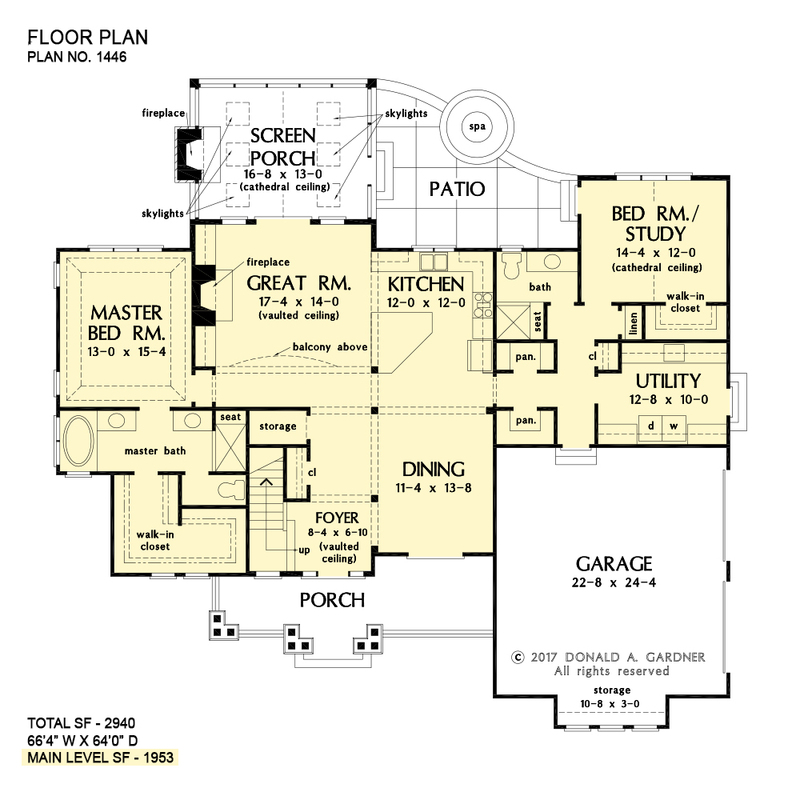 This floor plan is ideal for large or growing families with open living spaces making it easy to be together. The master suite and a bedroom/study are downstairs while three large bedrooms with walk-in closets are upstairs. A second-floor pocket office is a great space for children to complete homework or projects and a bonus room provides additional square footage for recreation or storage. 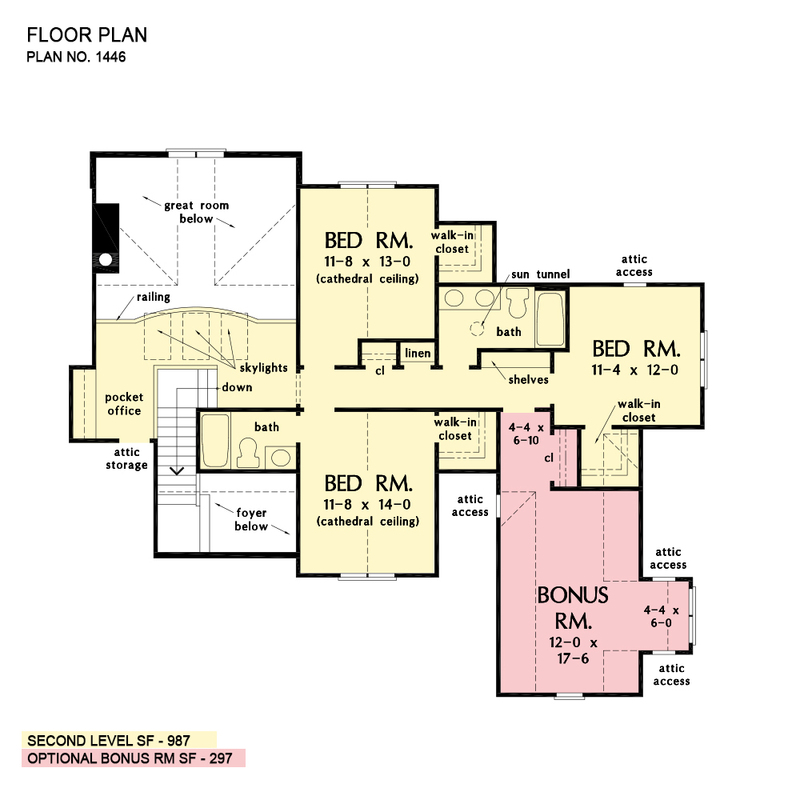 1st Floor: 1953 Sq. Ft.
Porch - Front: 202 Sq. Ft.
Porch - Screened: 260 Sq. Ft.
House Dimensions: 66' 4" x 64' 0"
Great Room: 17' 4" x 14' 0"
Bedroom #5 (Flat): 11' 4" x 12' 0" x 8' 0"
Pocket Office (Flat): 7' 4" x 6' 0" x 8' 0"
Storage (1st Fl.) (Clipped): 5' 8" x 3' 4" x 9' 0"
Balcony (Flat): 17' 4" x 4' 4" x 8' 0"
Foyer (Vaulted): 8' 4" x 6' 10" x 18' 1"
Dining Room (Flat): 11' 4" x 13' 8" x 9' 0"
Great Room (Vaulted): 17' 4" x 14' 0" x 18' 1"
Kitchen (Flat): 12' 0" x 12' 0" x 9' 0"
Utility Room (Flat): 12' 8" x 10' 0" x 9' 0"
Bonus Room (Clipped): 12' 0" x 17' 6" x 8' 0"
Garage (Flat): 22' 8" x 24' 4" x 0' 0"
Garage Storage (Flat): 10' 8" x 3' 0" x 0' 0"
Master Bedroom (Tray): 13' 0" x 15' 4" x 10' 6"
Bedroom / Study (Cathedral): 14' 4" x 12' 0" x 13' 10"
Bedroom #3 (Cathedral): 11' 8" x 14' 0" x 12' 0"
Bedroom #4 (Cathedral): 11' 8" x 13' 0" x 12' 0"
Porch - Front (Flat): 27' 8" x 6' 0" x 9' 0"
Deck / Patio (None): 19' 10" x 16' 8" x 0' 0"
Porch - Screen (Cathedral): 16' 8" x 13' 0" x 20' 0"